It’s amazing how fads come in go when it comes to methods in bringing in traffic to your site. With social media at it’s peak, the hype has gone wild about how social media determines traffic now days. But you’re smarter than that, and we know where it’s truly at, and that’s your email list. The money is in the list. Unfortunately, there are some challenges with making sure your emails reach your intended recipient. Guess what the number one email provider has done to make things interesting? Google has built an “organizer” within your Gmail to determine which messages go where. You’ve probably experienced this first hand – the website you signed up to receive updates for is now considered junk and lands in the “Promotion” tab, which in reality is junk mail. This is definitely not good for the marketer whose livelihood depends on traffic. If you have been looking for answers in how to get around this and you’re wanting to see your open rates increase, take a look at some of these tricks from fellow bloggers and marketers. I have also put together some examples of perfect newsletters here. Address the reader by their first name using Merge Tag tool within your email marketing program. This makes things more personal, and the person feels more connected to you and your story. This is possible within many popular email marketing tools, but Mailchimp is great for beginners and is free to start. Pat Flynn lands in my Gmail inbox about 95% of time due to this amazing name trick. In email marketing, personal touch wins. By keeping your message simple and natural, it makes the reader feel like you are writing directly to them. It also fools Google. Contrary to social media best practices, Gmail has its own rules. For whatever reason, Google sees images as a sign of a promotion or spam message. You will increase your readership by not having pictures. Here’s what my “Promotions” folder looks like inside. People like Michael Hyatt, Amy Porterfield, and Stan (Pushing Social) land in this tab. We’re talking million-dollar bloggers landing here now that Google has changed. The Promotions inbox is affecting everyone, especially since the old ways of developing email newsletters go against Google’s new rules. The point of the email is usually to drive traffic to your website, right? So, the prudent thing to do is write an exclusive email and give the reader reasons why they should click that link. Make it all natural and smooth of course. Now don’t get me wrong, you can get away with more than 1 link, but it’s not guaranteed you will survive the Google filter. Michael Hyatt hardly ever lands the Primary Tab. In this example above, you’ll notice 3 links within the first section of his email, and some of his emails contain up to 20 links. This definitely affects his open rates. 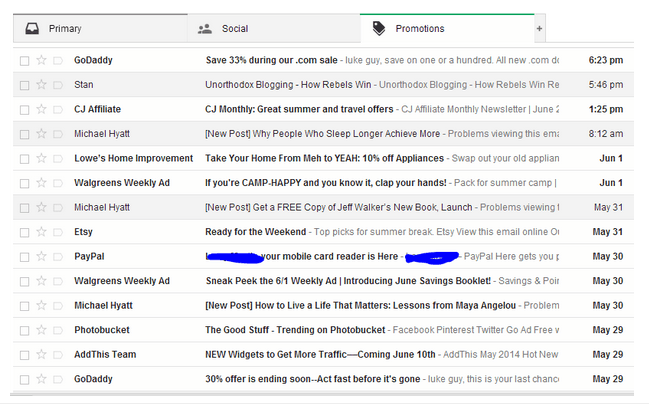 In my experience, almost every RSS feeds lands in my Promotions tab. Because RSS is automated, Google can surmise that it’s not being sent by a real person, so it doesn’t belong in Gmail Primary (even though I subscribed to it). This is a new trend that I’ve noticed in my research. The longer your email is, the less likely it makes it to Primary. Here’s a great example of a short email. Another great reason why Pat lands in my inbox. Trying to blatantly sell products or services will decrease the likelihood of landing in the Primary inbox. Lowe’s is a good example of this. Every time they try to sell something, it lands in my Promotions Tab. I understand that many people use third party email applications, and that they get every email sent to them because there are no filters involved. But as things get more crowded (like Facebook) you will see this apply across the platforms. It’s important to start thinking about these changes and consider some of the tips and tricks that work for landing in Gmail’s Primary Inbox. If not, you’re going to see a decline in traffic (and you may already have). So while email traffic thrives, I’d suggest you take advantage, and increase your open rates with these tips proven by popular bloggers. Luke Guy blogs at Lukeguy.com. He researches email marketing and how to grow businesses doing it. He loves finding new ways to grow your list and making it fun at the same time. He talks about other things, but usually it involves emailing.